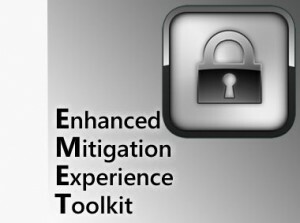 Enhanced Mitigation Experience Toolkit, or EMET, is a free tool from Microsoft that is meant to protect you from possible attacks. EMET uses Data Execution Prevention (DEP), in order to designate particular sections of memory as non-executable. This locks them up, preventing a malicious user from successfully running code on them. ASLR, or Address Space Layout Randomization, is also applied to choose non specific memory locations for files and programs to be stored. The randomization of their location will ensure that attackers are not able to target them effectively. The downside is that this could cause issues in the program’s performance. However it is possible to disable certain rules in EMET, or all of them, to make sure programs work as normal. Even though EMET is mainly intended for system administrators, any Windows user can set it up. By following a few steps, you can even start using EMET to enhance the security of old Windows XP systems. Combining a VPN service for layered protection is also a good way to increase security considerably. Internet Explorer, Microsoft Office and Adobe Reader are among the programs that are targeted most by attackers. Simply download, install and run EMET in order to secure them. Once EMET is running, select “Use Recommended Settings” and click Finish. From the Start Menu/Start Screen, run EMET GUI and click Import. Choose the PopularSoftware.xml file that is included and select Open. This file will allow you to apply additional rules for third-party programs like Firefox, Skype, Opera and even iTunes. To see the rules for applications, click on Apps, which will appear in the ribbon bar in the main window. For more information about these settings, you can click Help and then User Guide on the main window. You can customize the rules for any program by right-clicking on a running process and choosing “Configure Process”. If you notice that a program is not working while using EMET, you can un-tick the boxes in the App Configuration window. Alternatively, you can right-click on the application that is not working properly and select “Disable All Mitigations”. You can do the same for multiple apps at the same time. Hopefully our quick guide has helped you get started with using Microsoft’s new tool. While it probably still has a long way to go before provide excellent protection, this is a great step by Microsoft to help protect the average user. If you enjoyed this guide, and are interested in a bit more, we suggest checking out our guide to remove Windows 10 spying features.